HPD says three people are dead and another is injured after they broke into a home overnight. 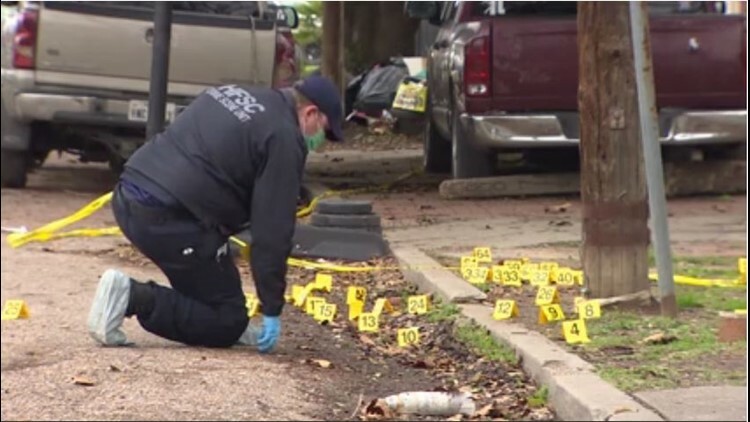 HOUSTON — Three people are dead and one is recovering after a home invasion in east Houston overnight. Police say four men forced their way into a home on Sherman at 71st around 12:45 a.m. Saturday. Detectives said the homeowner grabbed his gun and shot all four of the suspects. We're told one suspect died at the scene. Two others died at a hospital. The fourth suspect was taken to the hospital and went into surgery. The homeowner, who says the shooting was in self-defense, was reportedly not injured. Evidence markers littered the area outside of the home, showing dozens of rounds were fired. A detective out on the scene Saturday afternoon. A group of tearful women showed up Saturday morning down the block from where the shooting happened. They said they are related to the men who were shot and asked for privacy. A neighbor who lives nearby said he was on his porch with his baby when two men showed up with large rifles. That neighbor says he ran inside his home and took cover. He said he believes the men were at the home to rob his neighbor, however he says he does not know what they were after. He said he doesn't know his neighbor's name and only calls him "Flaco."